Henry V Medieval Sword Westminster Abbey, England Type: XVIII.1., 15th Century Medieval Sword. The Henry V’s sword is an iconic weapon that changed the political structure of medieval Europe during the 100 year war. Henry V’s sword is not only remembered for being a sword of kings, but also remembered as the iconic weapon in William Shakespeare’s play of the same name, which immortalised the St Crispin’s day speech, invoking the memory of “we few, we happy few, we band of brothers” which has resonated down the centuries. Being an historical piece, we carefully examined the sword in April of 2016. The sword, shield and helmet is displayed in the dimly lit basement of the Westminster Abbey in London, England. 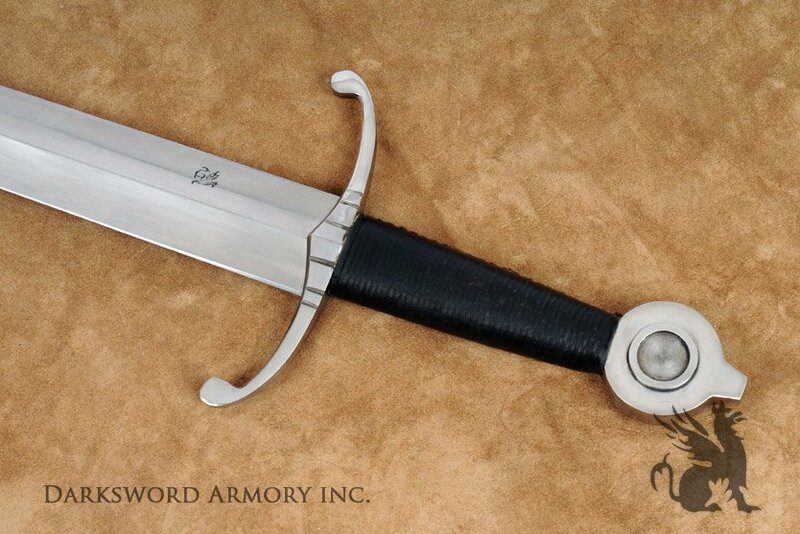 While striving to respect the historical proportions of the sword, we also recognize the importance of making it a functional piece for modern demands of students of the sword. 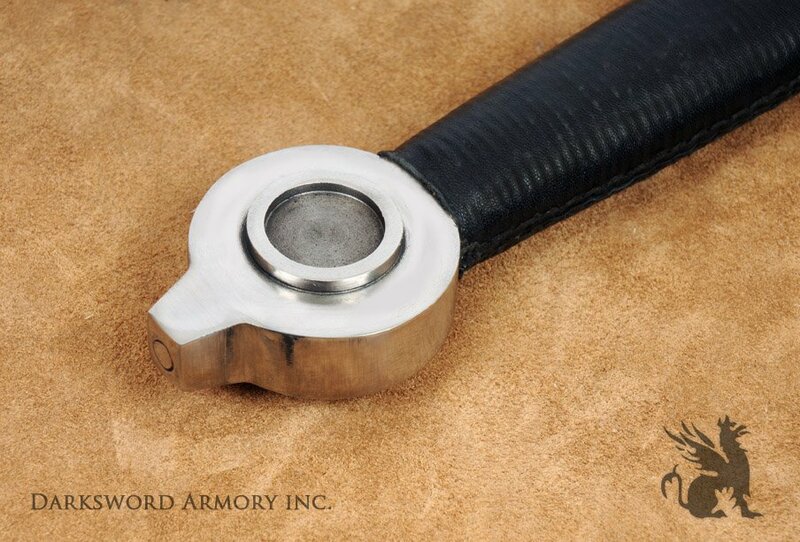 We proceeded to create a beautifully practical, yet sophisticated sword with an equally beautiful guard and pommel and peen-block. While creativity was kept to a minimum, given the historical character, we nonetheless decided to elaborate on the guard by broadening the tear drop with center curved arches and hollow ground diamond blade. 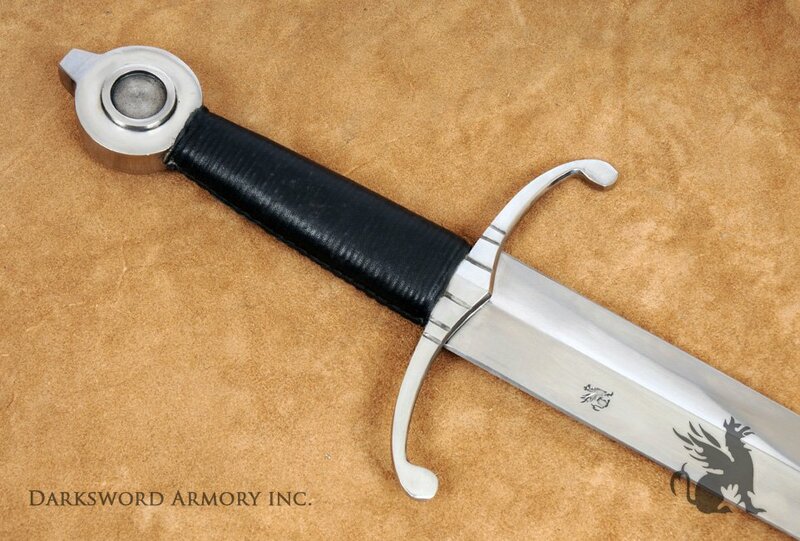 Like many arming swords during the Hundred Years’ War (1337-1453), Henry V’s sword was forged with clean minimalist lines repeated on the pommel, guard and blade, forming an artistic flow of coherent lines and symmetry. 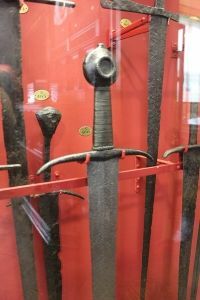 While not overly decorated, Henry V’s sword was nonetheless one of the most beautiful examples of a clean arming sword which spoke volumes about its creator and wielder. As such, considerable attention was paid to the crisp deep diamond shape geometry of the blade as well as its’ performance and balance. 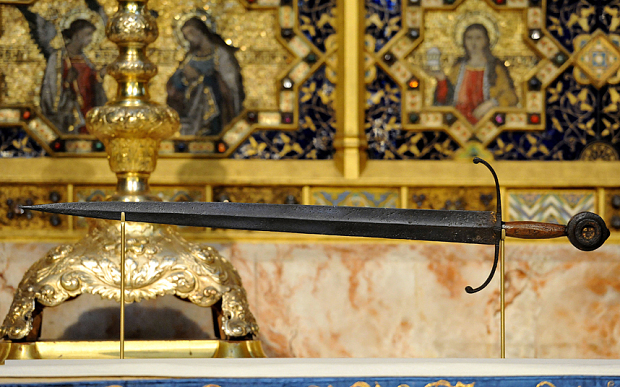 While not entirely a flat diamond blade, Henry V’s sword at the Westminster Abbey, is by no means hollow ground. We therefore felt that a simple diamond blade would not do justice to the sword and proceeded in making a low hollow ground diamond blade, making the center defined and crisp, but not overly con caved. 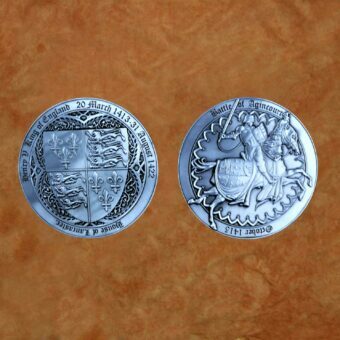 Henry V (1386-1422) waged war during a period of transition, witnessing an increase in heavy armor. 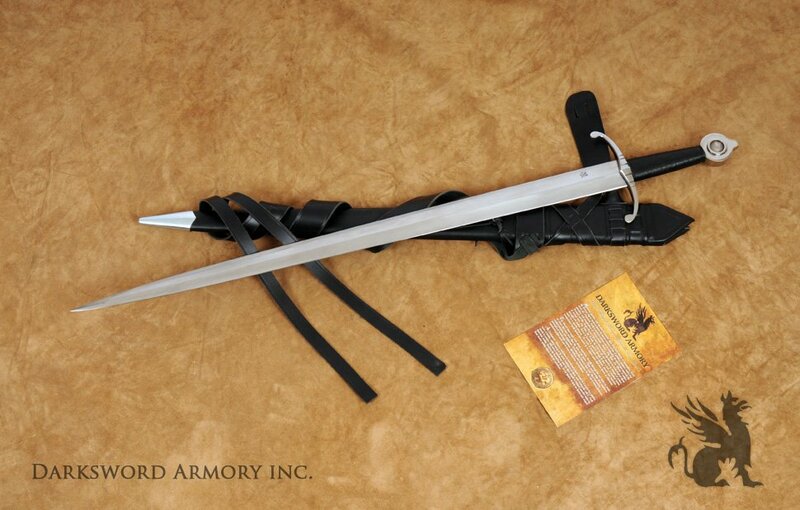 During the 15th century, as heavy armor became increasingly common, the arming sword became the medieval weapon of choice for both the mounted knight and foot soldier of considerable status. 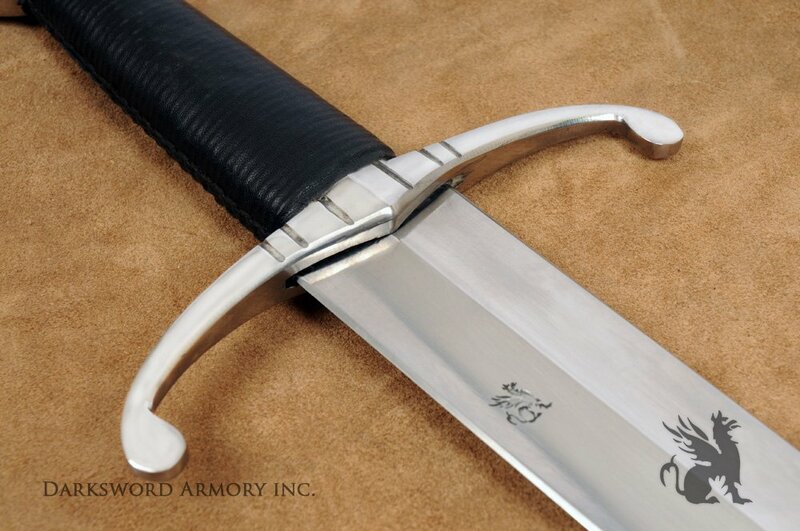 Shorter and stiff, the arming sword, classified as a type XVIII sword, was perfect for close quarter combat. It was light, well balanced and had a sharp tapper and stiff tip, specifically designed to puncture the newly advent of heavy armor. The diamond cross sectional blade gave the sword devastating stabbing force against plated armor and brigandines (leather vest lined with iron plates), while retaining its destructive cutting edge. The type XVIII sword was composed of a straight-tapering blade, with an acutely-pointed profile and stiff diamond cross section capable of both thrust and cut. A remarkable example is held at the Wallace collection. Henry V’s sword, as with all type XVIII arming swords, is a one handed sword. While mainly popular during the 14th and 15th C, arming swords such as the type XV, with a more flattened type diamond shape blade came into use during the later part of the 13th century. The hollow ground diamond shape counterpart (Type XVIII) According to Ewart Oakeshott, began during the second quarter of the 15th century. “the four faces of the blade, instead of being flat or very gently hollowed, are so strongly hollowed out that a nearly flat blade with a powerful upstanding mid-rib results….surviving examples seem not to date earlier than 1425” (Ewart Oakeshott, “The Sword in the Age of Chivalry” p, 59). During this period, sword geometry evolved to balance thrusting with the cutting geometry of previous periods. It was during this period that blade geometry began morphing more quickly as a response to the technological advances of the full plate armor of the medieval knights. 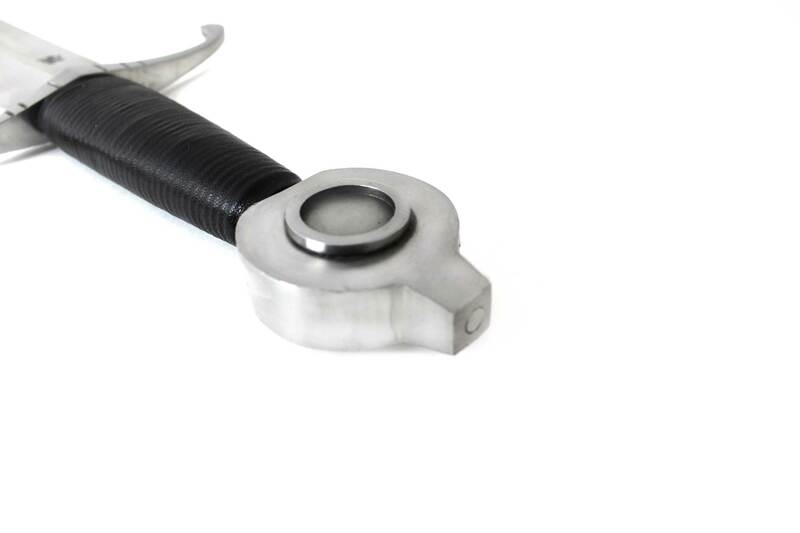 As such, we designed the sword with a deep hollow ground blade rather than a flat diamond cross sectional one. The blade is stiff and has a four-sided triangle-shape profile, with a diamond cross section, acute point and no fuller. Such blades were popular from the 15th century among the nobility for their resilience, light weight, dexterity and devastating thrusting capabilities. 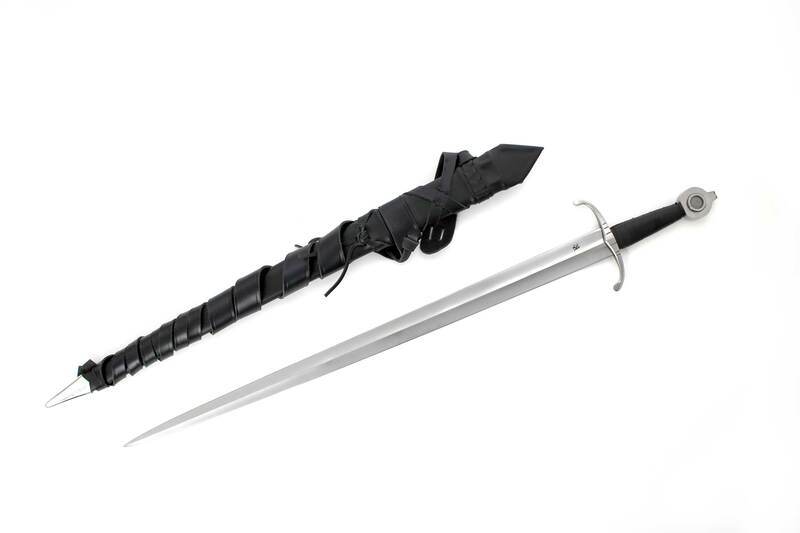 Due to these advantages, the type XVIII arming swords became the prevailing weapon of the 15th C.
Arming swords were exclusively owned by the elite aristocracy of the time. That said however, arming sword with flattened diamond blades were also used by the foot soldiers. Their use was so common among the knights of the German, French and English forces that it came to be known as the quintessential sword of the medieval knight of the 14th and 15th century. 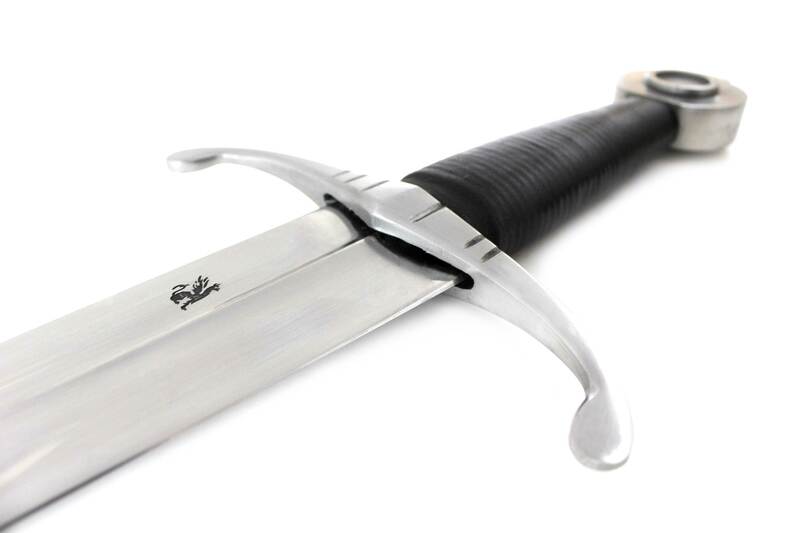 Being specifically designed for close quarter combat, we wanted the Henry V Sword to have superb handling capabilities, an exceptional response and a very good PoB (point of balance). 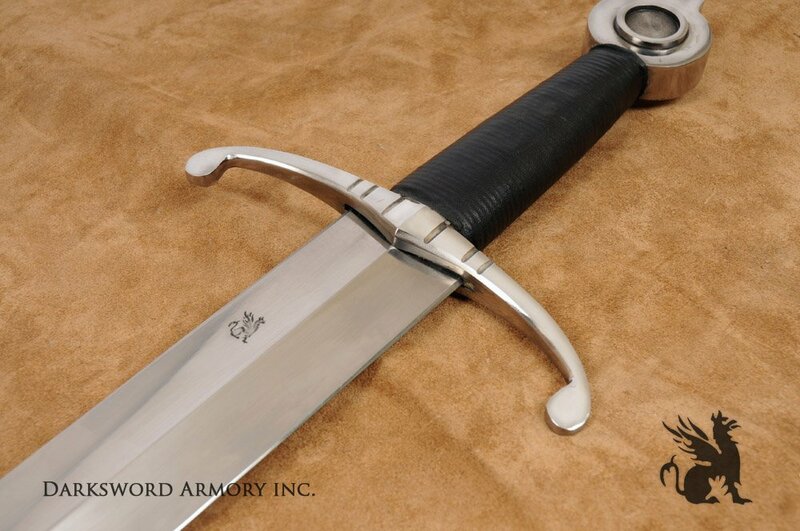 Paying considerable attention to the PoB, the Henry V sword is an exceptionally easy one handed medieval weapon to handle for both experienced and amateur sword enthusiasts. Okeshott described the sword as being graceful, with an acute tip. “the 2” wide blade dawns a four-sided flattened diamond cross section, typically associated with type XVIII Medieval Swords. The extremely tapered blade points to its transitional role from a purely hacking and slashing weapon to one that had both cutting and thrusting capabilities. In the late 14th C., improvements in plate armor began to appear and a new type of sword was required to successfully counter these improvements. As a whole, the design of Henry V’s sword, mostly due to its blade geometry, makes it as one of the most interesting swords to handle. 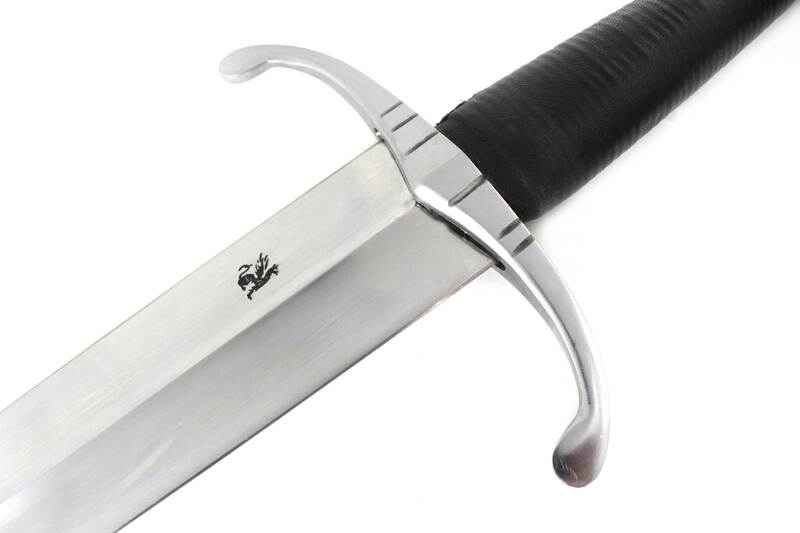 Perfectly balanced, responsive, powerful yet light, the Henry V sword is considered as one of the best conceived swords of the late medieval period. In later writings, Oakeshott described it as “..no mere funerary object, but as a magnificent fighting sword which comes to life in one’s hand.” Blade: 5160 High Carbon Steel. Dual Tempered HRc 60 48-50 at the core Total length: 39″ Blade length: 32″ Blade width at base: 2″ Weight: 2 lbs. Photograph of the original sword Henry V Sword Westminster Abbey, England Type: XVIII.1., 15th Century Sword. An excellent offering from DSA. This sword has outstanding edge geometry with the hollow-ground blade making it an excellent cutter but it is an equally good thrusting sword as well. I have to agree with Oakeshott on the exceptional handling characteristics of this sword. It cuts the air like no other sword I have handled. The weight and balance are spot on for me and as soon as I picked it up and worked through some dry handling moves, I could not wait to put it to work on some targets. This blade simply comes alive in your hand and wants to cut. So great to have an example of the sword of a king in your hands. Thank you Darksword for another great product.